Did Jesus exist, die and resurrect? He promised to provide his views only after reading mine. Hence this unique situation where I am providing my ‘defence’ before the ‘prosecution’ presents its case! My defence relies on evidence from both the Holy Bible and the Holy Quran – books written by descendants of two rival brothers, Isaac (Ishaq) and Ismail (Ishmael). Was Jesus (Isa) conceived and born? Yes, I believe that he existed as a human being, just like any biological mammal. He therefore satisfied the characteristics of mammals, including being conceived and being born as a fully formed baby. Although I have personal concerns about Mary’s Virgin conception doctrine, the challenge is whether Jesus was conceived and not how he was conceived. The biblical version of Mary’s virgin conception is documented in Luke: …God sent the angel Gabriel … The virgin’s name was Mary … ‘You will conceive and give birth to a son, and you are to call him Jesus’ … ‘How will this be,’ Mary asked the angel, ‘since I am a virgin?’ The angel answered, ‘The Holy Spirit will come on you, and the power of the Most High will overshadow you’ [Luke1:26-38]. The Quran supports the virgin conception: … She said: ‘How shall I have a son, seeing that no man has touched me, and I am not unchaste?’ He said: ‘So (it will be): Thy Lord saith, ‘that is easy for Me: … ‘So she conceived him …’ [Surah19:20-22]. Both the Bible and the Quran concur on Jesus’ birth. They only differ on where he was born – in a manger (Bible) and under a palm-tree (Quran). Jesus’ birth is documented in Luke: …the time came for the baby to be born, and she gave birth to her firstborn, a son. She wrapped him in cloths and placed him in a manger [Luke 2:6-7]. … Mary and Joseph, and the baby… [Luke 2:16]. The Quran states that: …And the pains of childbirth drove her to the trunk of a palm-tree: She cried (in her anguish). … At length she brought the (babe) to her people, carrying him (in her arms). … But she pointed to the babe. They said: ‘How can we talk to one who is a child in the cradle?’ [Surah 19:23-29]. I believe that Jesus existed and by his existence, had relatives. The historical existence of a human being can be proved by tracing historical documentation about them including their family tree. I focus on the family tree. I draw your attention to an online biblical exhibit at: http://www.complete-bible-genealogy.com/family_tree/jacob_2827.htm. Compare it with the Islamic exhibit presented in the JPEG file (i.e. Family tree of prophets) attached at bottom of this article. It is evident from both exhibits that Jesus (Isa) is a descendant of Isaac (Ishaq). Jesus’ brothers and/or sisters are identified in Mathew and in Mark. … ‘Isn’t this the carpenter’s son? Isn’t his mother’s name Mary, and aren’t his brothers James, Joseph, Simon and Judas? Aren’t all his sisters with us? [Mathew 13:54-56; and Mark 6:3]… ‘Mary the mother of Jesus, and with his brothers’ [Acts1:14]. … ‘Mary the mother of James the younger and of Joseph, and Salome’ [Mark15:40]… ‘Mary the mother of Joseph’ [Mark15:47]… ‘Mary the mother of James and Joseph’ [Mathew 27:56]… ‘Mary the mother of James and Salome’ [Mark 16:1]. Catholics argue that Jesus’ brothers and sisters were the children of Joseph from a previous marriage (Joseph’s dead first wife? ), and suggest that Mary remained a virgin in a religious context. I beg to differ (a little bit!). There is a high likelihood that the above mentioned were Jesus’ real brothers and sisters. Mathew states that: … When Joseph woke up, he did what the angel of the Lord had commanded him and took Mary home as his wife. But he did not consummate their marriage until she gave birth to a son [Mathew1:24-25]. If Joseph consummated their marriage after the birth of Jesus, then they probably had other children – those identified above. Also assess Luke’s statement: … ‘and she gave birth to her firstborn, a son’ [Luke 2:7]. Surely, when writing/narrating in a historical context, isn’t it a fact that reference is made to a firstborn only if there were at least two children? Why didn’t Luke write, ‘her son’ or better still ‘her only son’? Anyway, it doesn’t matter whether they were step-brothers, step-sisters or cousins. Jesus’ immediate and extended family tree is, to me, a testimony of his existence. The historical reality of Jesus’ crucifixion is an essential doctrine of the Christian faith. Without the crucifixion the resurrection becomes irrelevant, and without the resurrection Christianity itself is rendered meaningless – because the death of the Jesus was essential to pay for the sins of believers [Corinthians15:13-19]. Jesus’ crucifixion and death are extensively documented in biblical scriptures [i.e. Mathew 27; John 19]. Jesus’ ‘after death’ proof comes by word of Mary Magdalene and by word of the disciples, including the famous story about doubting Thomas [John20:11-29]. This has raised conspiracy theories. Some none-believers claim that Jesus only fainted then recovered from his wounds, others suggest that his body was stolen, and some assert that the disciples hallucinated. The strongest differing view is presented in the Quran. However, only one version can be correct. My approach is to subject the Quran’s version to scrutiny. Muslims believe that Jesus wasn’t crucified and that he never died. They don’t believe ‘Allah would allow His prophet Isa to die a torturous death’ – they suggest that someone (perhaps Judas Iscariot) surreptitiously took Jesus’ place on the cross. … That they said (in boast), ‘We killed Christ Jesus the son of Mary, the Apostle of Allah’; but they killed him not, nor crucified him, but so it was made to appear to them, and those who differ therein are full of doubts, with no (certain) knowledge, but only conjecture to follow, for of a surety they killed him not [Surah 4:157]. Muslims instead believe that God miraculously took Jesus into heaven alive… ‘Allah raised him up unto Himself; and Allah is Exalted in Power, Wise. And there is none of the People of the Book but must believe in him before his death; and on the Day of Judgment he will be a witness against them [Surah 4:158-9]… ‘Behold!’ Allah said: ‘O Jesus! I will take thee and raise thee to Myself’ [Surah3:55]. 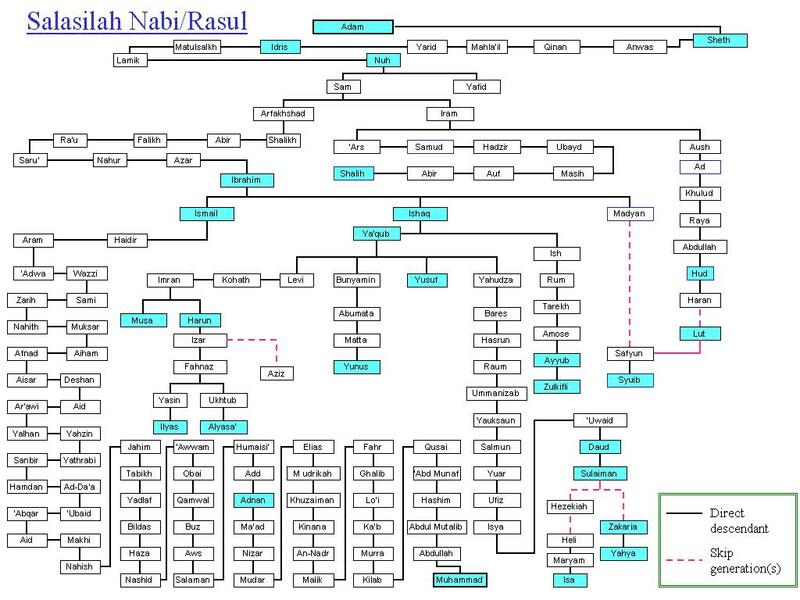 Let me draw your attention to exhibit [Family tree of prophets]. In this exhibit, all the prophets, including Isa (Jesus) are highlighted in Bermuda-blue – because Muslims believe Jesus wasn’t any different from the other prophets. Yet they also believe that among all prophets (Bermuda-blues), only Adam and Jesus were created directly by God… ‘The similitude of Jesus before Allah is as that of Adam; He created him from dust, then said to him: ‘Be’. And he was [Surah3:59]. Likewise, as stated above, Muslims believe that all the prophets including Adam died – except (only) Isa, who God ‘miraculously’ took to heaven alive. I can understand why a direct ‘creation’ could happen to Adam – because he was the first human being. However, I fail to understand why among all the other (equal) ‘Bermuda-blues’, only Jesus would be created directly, and only Jesus would be taken to heaven alive! The Quran doesn’t justify this. I conclude that Muslims believe in the crucifixion, even if it is of ‘substitute’ Judas. Because they believe in the crucifixion, they must by induction also believe in the (biblical) narratives leading to that ‘deceitful’ crucifixion – the substitution of Judas for Jesus, if true, could only have happened at a stage closer to the crucifixion itself! Evidently, the Quran doesn’t offer a robust explanation of what actually happened at crucifixion and at the ‘suggested’ ascension – its arguments are only speculative! I am not saying the Quran is wrong. But, I have to make a choice between the Quran’s speculation, and the consistent accounts and predictions of Jesus’ death in both the new and old testaments. That is why I believe that Jesus died, like any other mammal, and fulfilled the characteristics of living things – birth and death. Do I believe in Jesus’ resurrection? Let us first consider the security narratives. ‘…Joseph took the body… and placed it in his own new tomb… He rolled a big stone in front of the entrance to the tomb… [Mathew 27:59-60]… So give the order for the tomb to be made secure until the third day. Otherwise, his disciples may come and steal the body [Mathew 27:64]… So they went and made the tomb secure by putting a seal on the stone and posting the guard [Mathew 27:64]. The above narrative suggests that the only way to get the body in/out was through the entrance, with a sealed very large stone. Anyone who attempted to move the stone from the entrance would have broken the seal and thereby alerted the renown ‘Roman@ guard! Yet, Jesus’ tomb was mysteriously empty on the third day [John 20:1-10]. The remains (relics/skeleton) of someone are the best proof of their death. But a resurrection, by its nature, destroys that invaluable evidence. It is impossible to prove (or disprove) resurrection without physical evidence. It is equally difficult to gather evidence about a resurrection – creating a vicious circle of impossibilities! When I weigh the above security implications and integrate them with my Catholic faith, I on the balance moderately incline towards the resurrection doctrine. I rest my defence and call upon the prosecution to present its case. It might take a while to download – so be patient. You will have to use the search facility to get to the person you are looking for – click ‘Edit’, followed by ‘Find on this page’ then type in the name of the person you intend to search. The family tree of the prophets is designed from the Islamic perspective. It therefore shows complete documentation of Ismail’s direct descendants, but skips some generations of Isaac’s descendants. Jesus is named Isa in this chart. This question takes us to beyond 2,000 years ago. If you are a non-believer, you cannot believe from social media. You quoted both Bible and Koran; the two books are not the same: you cannot compare Jesus with Muhammad. Bible does not mention Koran, but Koran mentions Bible, especially Mary the mother of Jesus and the only woman mentioned in Koran. This proves that there was a person called Jesus born of a woman. You don’t have to believe in him – many people did not and even killed him!